Do you have a favourite quotation, saying, marketing text or copyright, and probably an image too that you usually include in every single blog post of yours? If yes, have you found it somewhat bothersome to copy and paste the text or code repeatedly each time you create a new post? Well, just in case you're unaware, there is a fantastic tool available in your blog's setting called Post Template, just waiting for your use! This feature is truly a great time-saver which will do it automatically for you. 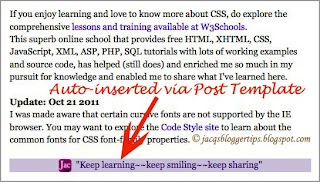 Once you enable this function by pre-formatting the post editor with your special text or html code, it will render them all automatically each time you click to create a new post. 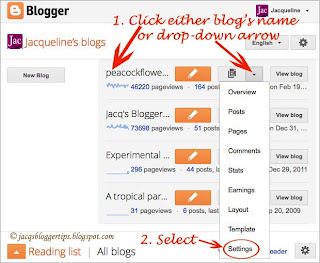 Click either on your Blog's Name (or on the Dropdown Menu next to the post list icon and select Settings). Click Settings > Posts and comments. 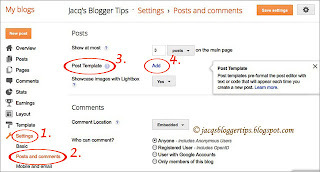 Then locate the Post Template section and click Add to its right. Enter your text or code in the box provided. Ensure that proper HTML codes with CSS are used for text formatting and styling (learn more about HTML/CSS at W3Schools). Click Save Settings when you're done. Illustrated in the image below is an example of codes I've used to format my favourite phrase. You can even include an uploaded image such as your own created signature. 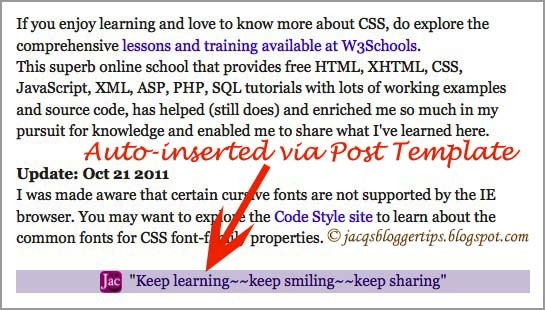 Learn how to use the <img> tag at W3Schools, for this purpose if you wish. Next, click the New Post icon to view the result. 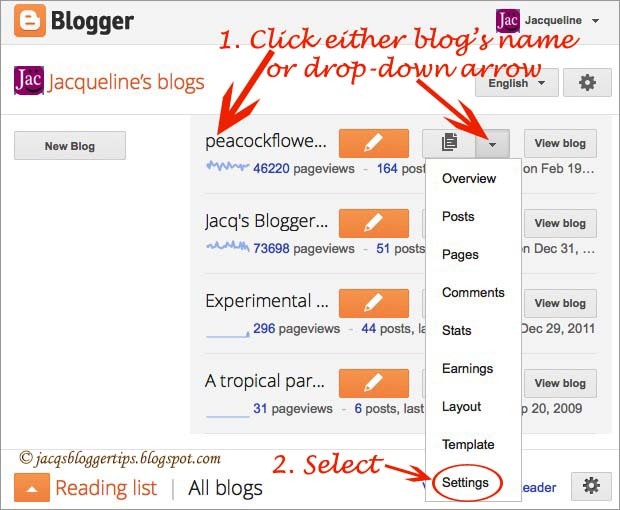 Your pre-formatted data will appear automatically in the post editor each time you create a new post. That's all to it. Hope this sharing helps. Enjoy! Yes I've read this here now, and maybe later i will try this, if time permits. Try it out, Andrea... it's a useful feature if you have such repetitive text/image for every post. The image displayed at Step 4 above is already an example. Moreover, I've also included links to W3Schools where the basics of HTML & CSS are taught. Hence, I think it best for whoever is interested to try to create his or her own post template and be proud of one's own creativity and achievement. You're most welcome, Cactus Mark! Delighted to know you're pleased, Ngan Khanh! Sorry Marsha, my reply at http://jacqsbloggertips.blogspot.com/2011/01/customize-and-style-read-more-link-in.html?showComment=1343962623602#c8785032684098673206 is all that I can offer due to my limited technical know-how. Anyway, when you customize your blog's template and go to 'Advanced', you can change the background to 'transparent'. thanks for the post. I was wondering how to create a template of fixed headings since I rarely post pics. but i guess your links(haven't read them yet) will provide more on that. I'll check out it later when I have time to tackle CSS(not so keen on that). The pleasure of sharing is all mine, MMD! Thanks for your appreciation. You're most welcome, Fallenrhainnes! Thanks for taking the trouble to share your thoughts here. Fascinating blog! Your depiction is attention-grabbing. Thanks for sharing your valued vision. Thanks for your kind thoughts which is very appreciated, OSDeveloper! Great idea. Your trick might useful for me. Thanks, MazDipo and all the best in implementing this tip! Thank you so much Jacqueline for this useful article, it really helped me! Hi! For me this html etc is Greek and Latin but you have done a great job here. I just wanted to create a post template and link my facebook and twitter accounts in the template. Can it be done? Thanks Archana for your kind compliment. I'm not sure but you can try adding your links into the box as shown in step 4 above to see if it works, otherwise you can just remove them. You're most welcome and thanks for your compliment and encouragement. The pleasure is all mine! I hope to fulfill that too but my current ill-health and time constraint online are obstacles for the time being. My pleasure, Ammar. Thanks for the compliment. Love this post... will save me a lot of time. Thanks a lot! You're very welcome, Erik. Glad you love it. Hi Jacqueline ~ I'm trying to add a photo to my blogger post template, can't seem to figure this out! Help?!!!! (where the URL OF THE IMAGE is the entire URL of your uploaded image as stored by your photo hosting website, such as Blogger, Photobucket or Flickr). Thank you for this wonderful information. It would be nice to have a end mark at the end of each post. My pleasure in sharing, Zahid. Thanks. You're most welcome, Abah Bhima. Hope you could post also a template like for social media for us who doesn't know about HTML. But still, your post helps! Thank you! 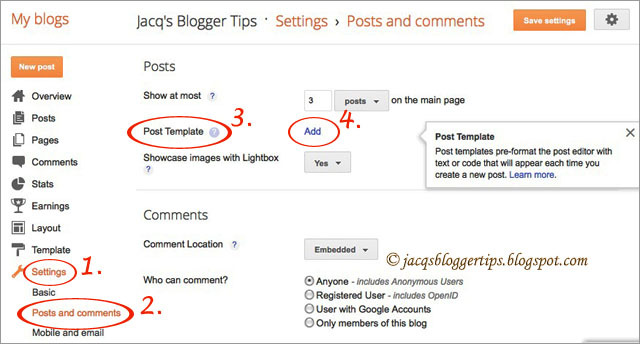 Dint know that the post template option on blogger settins was usefull untill now, thanks very much. very interesting.. step by step will be understand.. thanks for sharing!